Tindora / Ivy Gourd / Little Watermelon / Gentleman's Toes / Kovakkai is quite a tasty vegetable. I first tasted this when my mother in law made it and have never had it before. I loved the taste and started preparing it by cooking it as a side dish with onions and spices. 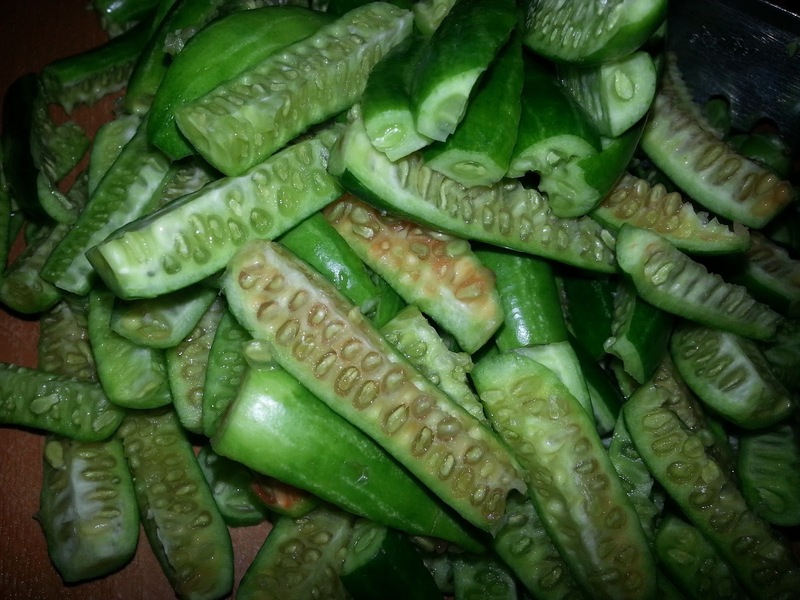 When I started making the okra fry, both I and my husband loved it. My husband ate a hearty quantity of okra for the first time and I tried to prepare Tindora in the same way and it turned out to be a big hit. So I started preparing Tindora in this way more regularly. It is exactly the same recipe of Okra fry with Tindora in place of the okra. 1. Wash and dry Tindora. Chop the top and tail ends then cut each vertically into 4 pieces. 7. Add tindora, chilli powder, turmeric powder and salt and mix well. 10. Reduce the flame to low and keep frying till tindora turns soft and a little brown. Make sure not to burn. Roast for about 15-20 minutes.